Cherry blossom tattoos are a popular choice. While some cultures view them as a sign of springtime and youth, other cultures believe that they represent how fragile life can be. In Japanese culture, these tattoos are thought to symbolize beauty. Cherry blossoms only flower for a short time before they disappear. Because of this, they are a reminder to live in the present moment. 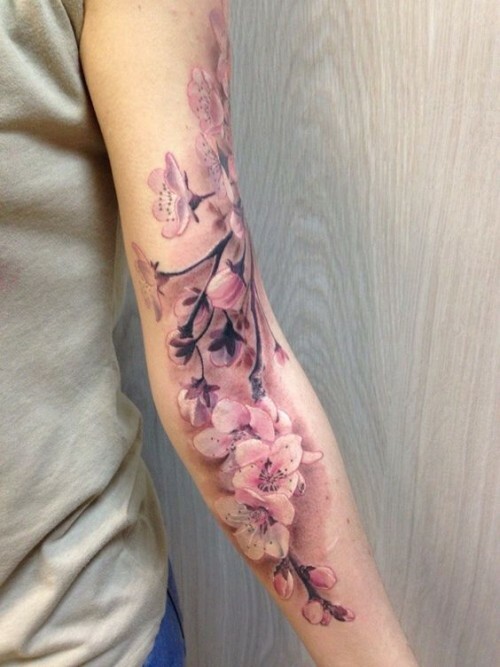 Since this is a main tenant of Buddhist philosophy, cherry blossom tattoos are often used by Buddhists. In this religion, they can also symbolize a greater knowledge of the self, working toward enlightenment and wisdom. Many Japanese are Buddhists, so some of the tattoo meanings overlap for Buddhism and Japanese culture. Cherry blossoms can symbolize how transient life is and how beautiful things ultimately pass away. The link to mortality is extremely symbolic and shows the fragility of life. Likewise, these tattoos can symbolize the fleeting beauty of existence. In the ancient art of woodblocking, the Japanese often use cherry blossoms. Your tattoo can symbolize a lost love or the temporary beauty of life. Interestingly, the cherry blossom is considered the national flower of Japan and is known as “Sakura” in Japanese. Since this flower is often used as a ceremonial symbol, it can also be used to decorate offices and homes. Some Japanese cultures like the samurai use the cherry blossoms to represent blood drops. They can also symbolize spring, simplicity and innocence. In Chinese culture, cherry blossoms can be a symbol of love or sexual beauty. They may represent empowerment, femininity or female beauty. In addition, Chinese culture often considers the cherry blossom to be a symbol of love and feminine attraction. Asian cultures also believe that the cherry blossom promotes spiritual awareness. It can be used to mean industriousness, braveness or wisdom. Cherry blossoms only bloom for a very short period of time before they suddenly die off. As a result, cherry blossoms are a reminder of our mortality and humility. It is a reminder to live well because everything can be gone in just a moment. When the cherry blossoms appear, it is the start of a new year in Japan. As such, the cherry blossom is a symbol of new beginnings and hope. It is a sign that people should be optimistic and take on new opportunities in the coming year. While every person is unique, the two genders typically have certain styles of cherry blossom tattoos. 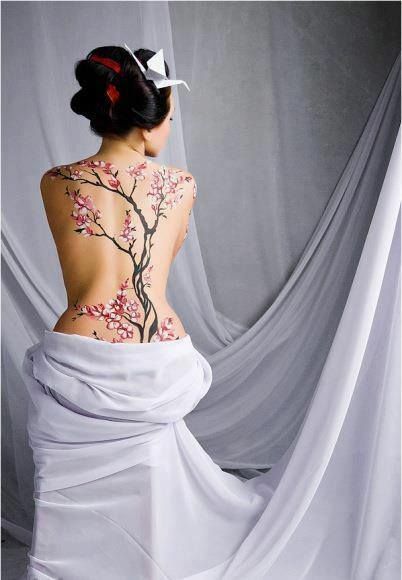 Often, women intertwine their cherry blossom tattoos with butterflies, the Sakura tree, hearts or stars. Meanwhile, men can customize their tattoo with fire, skulls or geishas. Men and women often customize their tattoos with symbols like koi fish or important quotes. Every person is different, and a cherry blossom tattoo can be used to show their personal beliefs or unique personality. Where Should the Tattoo Be? Meanwhile, smaller tattoos can be done on your neck, ankle, wrist, hand or foot. Since the cherry blossom is increasingly popular in modern times, you will see it appear just about anywhere on a person’s body. For the best results, make sure to consult with your tattoo artist about tattoo styles, sizes and the best place to put them.